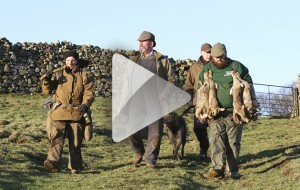 The Yorkshire Dales is a rabbiting utopia. The limestone rock dictates the topography and architecture of its numerous warrens. Thin, overlying soils and moorland management ensure most rabbits live a sessile existence. But we forget how unforgiving the natural world can be in such wild regions of our country. This year, Mother Nature is the rabbits’ greatest enemy and, as we precariously made our way to the top of the Dales, we saw one of the cruellest hands ever dealt to lagomorphs — the disease myxomatosis. Fortunately, rabbits are survivors. My visit to the Dales was my personal pilgrimage. 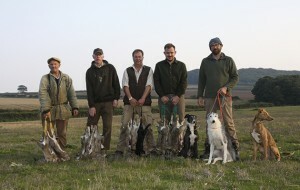 Armed only with cameras and enthusiasm, I had wriggled free from the shackles of expectation that can dampen my enjoyment of rabbiting. The chance to walk out with Ian Clayton — more widely known as Torchie — was one not to miss. He is a gentleman with a terrific rabbiting brain and is a master of the craft of net-making. Before we met up, he had just completed gruelling shift work in Sheffield — rabbiting is his way of staying in touch with nature. 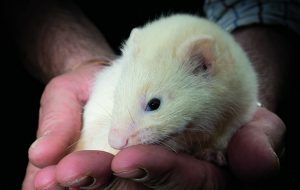 The sense of freedom when mooching across the Dales with his dog, Dan, and his ferrets is one that Torchie’s predecessors must have felt after working in the mines, mills or factories of the industrial cities, towns and villages of northern England. This endless landscape’s draw is almost tribal. Whether training a spaniel running a lurcher, or rabbiting with net and ferret, all disciplines focus on the same aim: sampling the saturation of rabbits and gleaning the educational benefits offered by the Yorkshire Dales. My thoughts were no different. As my show season draws to a close, my window of rabbiting opportunity opens once more. Though my bread-and-butter rabbiting is well under way, I took the opportunity to make the trek northwards. 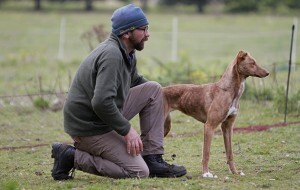 Torchie — his name refers to his love of lamping with his lurchers in days gone by — planned to use his sidekick Dan in a manner as unfamiliar to me as a day on the Dales. Unique in stature and definitely not in vogue by today’s standards, Dan is function over fashion — a reverse colliegreyhound lurcher made up of threequarters collie and a quarter greyhound. He is not the most athletic but was created to work among the sheep and rocks of the Dales, where speed isn’t everything but honesty, attentiveness and the ability to take a knock are. The day was to be a simple affair. From the moment Dan left the farmer’s red Land Rover he raked about the grassland, found and marked a warren. Torchie then slipped in a ferret or two and we let Dan course, catch and retrieve the rabbits. 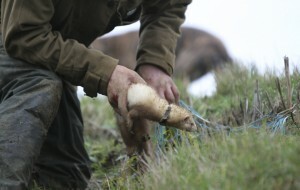 Normally, nets would be laid to prevent any escapees but we wanted to return to the cornerstone of what ferreting should be about: like-minded souls enjoying each other’s company, taking in the breathtaking scenery and producing good working animals while harvesting a stack of rabbits for the butcher. In the grand scale of things, our style did not particularly matter as these lacklustre Yorkshire rabbits stood little chance of escape. For whatever reason, they appeared lethargic and hesitant, more so than usual. Perhaps the onset of or recovery from myxomatosis had taken its toll but, to be honest, even in full fettle the result would have been the same. 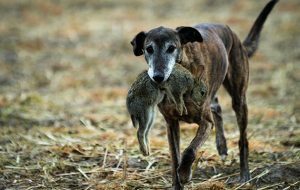 Perched on the warren, all bright-eyed and alert, the big-boned lurcher stood attentively alongside a well-used rabbit hole. His ears were erect and moving independently, giving us an obvious indication of occupancy. Sniffing into the breeze, his nose sampled the airborne scent as his experience shone through. Torchie needs his rabbiting dogs to mark true and honestly. Inches, not yards, separated hunter from hunted. This unmistakable fact has stood Dan in good stead while learning his trade. 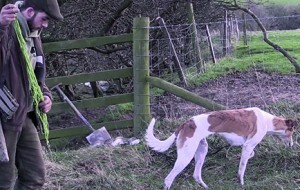 From puppyhood he has seen rabbits run into these warrens, a ferret enter and the rabbit jump back out again. This constant reinforcing or “honouring” of his mark has honed his skills. This saves Torchie valuable time in trying to evict non-existent rabbits from barren warrens. On this ground he need not be a Usain Bolt of the lurcher world, just a bit quicker than the rabbit, and with his experience of anticipating the bolt, he usually is. We worked the warrens with jill ferrets. Lighter and quicker than their male counterparts, they flowed through the warrens. Torchie favours them because he wants a bolt and a clean rabbit for the butcher, as opposed to digging them out. Once the gladiators are in battle, the surge of adrenalin you get, no matter how many times you hear that unmistakable rumbling, especially on land with no noise pollution, is addictive. The action inside the subterranean arena felt like it was directly under our feet. It was — literally. A deep warren on these parts is measured in inches, in extreme cases feet, but never in yards. 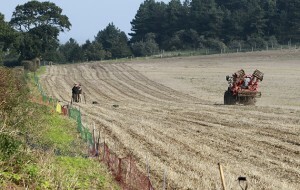 The underlying limestone ensures that the rabbits can only dig down so far. On several occasions I bolted rabbits with my feet as my bodyweight compressed the already shallow pipe and forced the occupants out. Oh, how I wished I had my dog Bella at times like these. Due to the shallow warrens, Torchie still uses the Mk1 ferret finder. His little grey box has had a few coats of bright paint to avoid being lost. Technology that was created at the turn of the 1970s is still being used to good effect all these decades later. Torchie admits he is reluctant to change as this is what he is used to. After a quick dip with the spade, we separated the warren from its architect and on one occasion Torchie spotted two rear ends. So, with swift hands he pulled one out, despatched it and placed it under his arm, and, in the same movement, removed the other without giving either the chance to make good their escape. As the game carriers filled up, Dan was becoming increasingly tired. 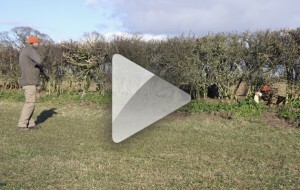 His greying muzzle quivered as he cantered back after losing a rabbit to the ancient wall dividing the fields, which provides shelter not only for the sheep but also for wily rabbits. Given that Dan’s main attribute is marking, not speed, he continued to mark the wall accurately even though he was weary. I had a scratch about and removed four rabbits from within the wall with my monkey-like arms, three from one area. Deciding to give the old boy a helping hand, a few of the nets came out. A totem for net-making, Torchie’s wares from his old-before-time hands are a delight to use. 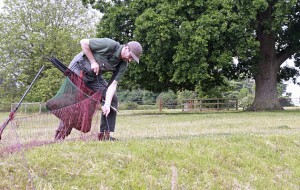 His rabbiting brain means his bespoke nets are tailored to suit the terrain their owners work. His foundation for a good net is that it must have a bit of life about it, be quick and easy to open but even easier to lay. Over the years my nets have repaid my investment many times over — a good net makes all the difference. Torchie’s nets mirror the man who made them — they stand the test of time, are a joy to work with, and never let me down or fail to deliver when the going gets tough.